Hi everyone! 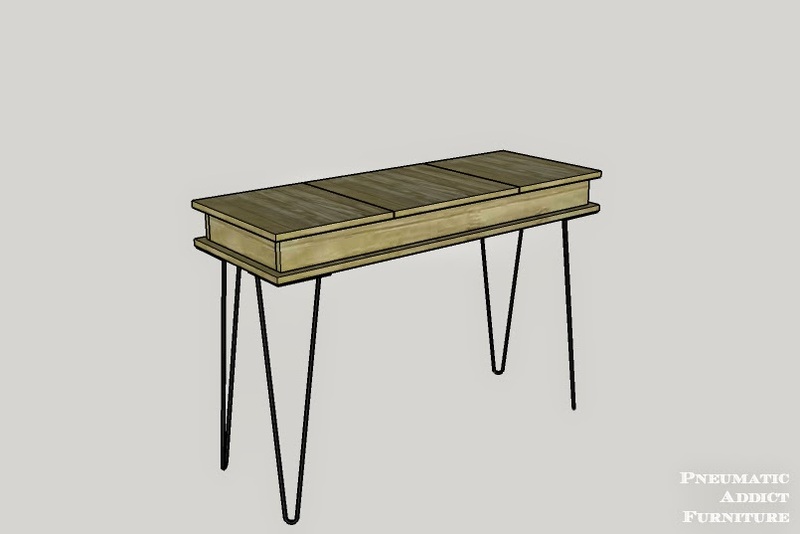 I got a new set of furniture plans fresh and hot out of the oven for you. Seeing how Mother's day is right around the corner, I've been thinking about projects that a Mom might need. 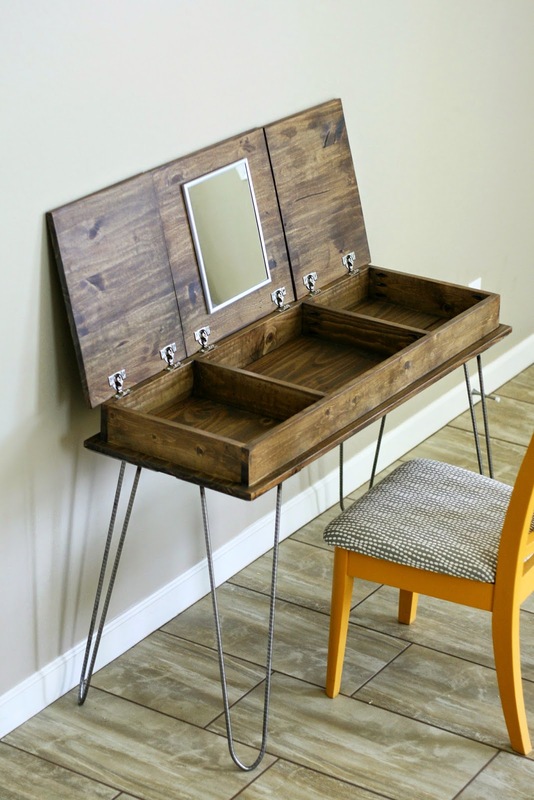 I happen to be a mom and I decided I would love a make-up vanity that I could sit at and get ready for the day, so that's what I came up with. 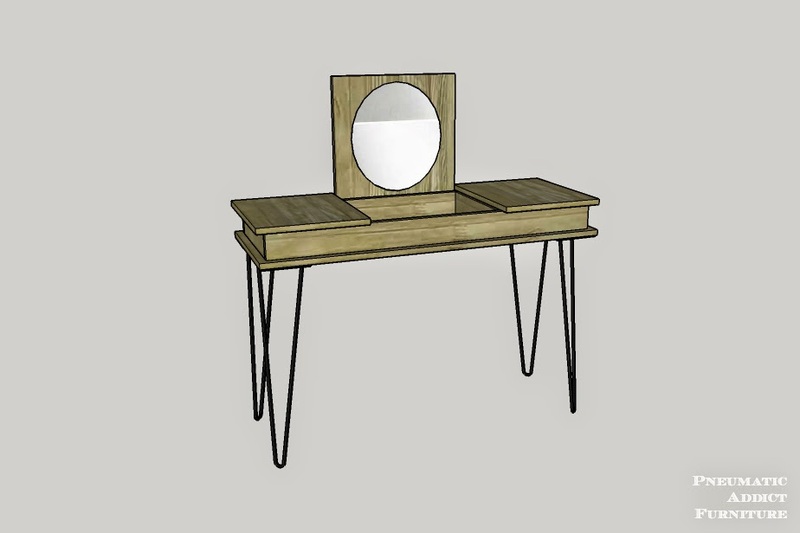 Since I'm digging more modern, clean lines right now, my DIY vanity has just that. Not only do I have free building plans for you guys, but thanks to Kreg Tools, I have a super awesome giveaway for you guys! Keep reading for the details. 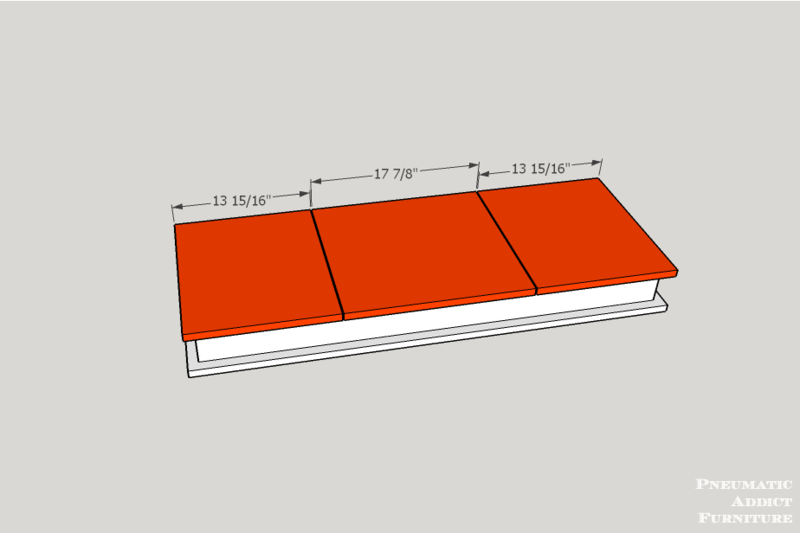 (2) 1 x 18 x 48"
(2) 1 x 4 x 96"
(2) 1 x 18 @ 46"
(2) 1 x 4 @ 44"
(4) 1 x 4 @ 13 3/4"
Start with your 1 x 18 boards. 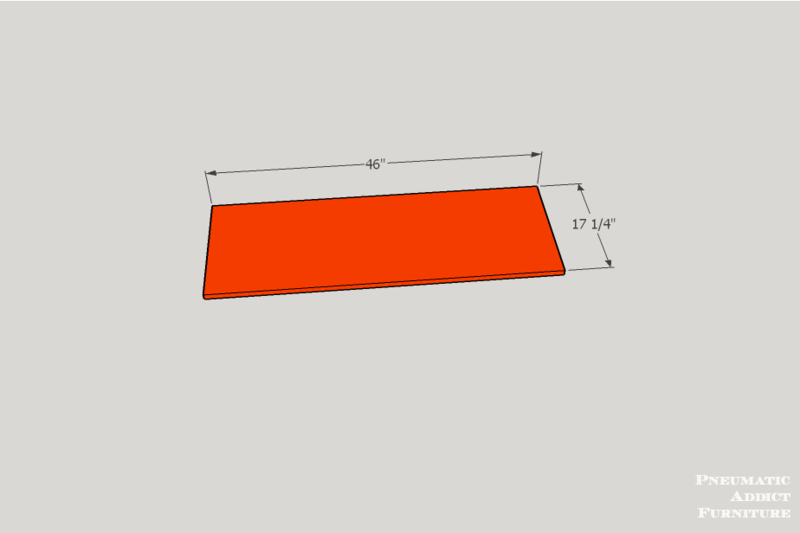 Of course 18" is the "nominal" width; they should actually measure 17 1/4" wide. 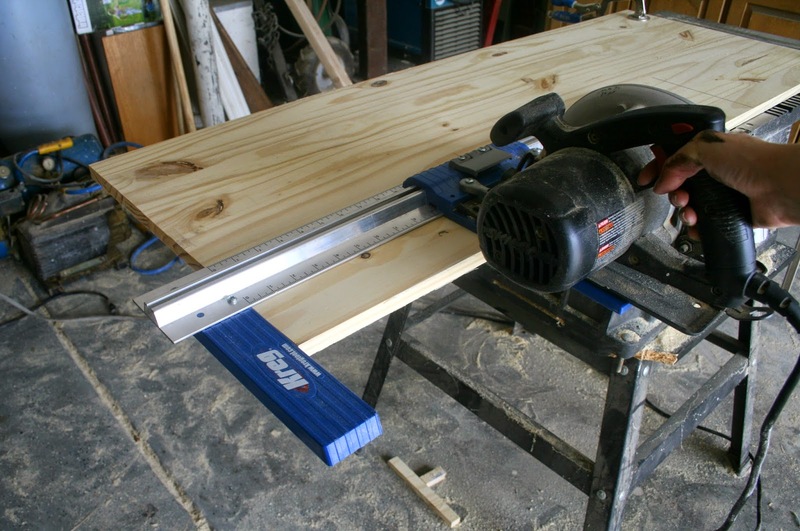 Cut both boards down to 46" in length using a either a table saw or a circular saw attached to a cutting guide, like the Kreg Rip-Cut™. Next, cut the 1 x 4's to length. On each 13 3/4" piece, drill 3, evenly spaced pocket holes on the same side on each end. Take your first 1 x 18, and draw a line 1" from all 4 sides. Line up the 44" 1 x 4's along the line and attach them via 2 1/2" wood screws from the bottom, making sure to pre-drill and countersink. Now, attach one of the shorter 1 x 4's, parallel and flush with the ends of the longer boards, using 1 1/4" pocket hole screws. Measure 11 7/8" from the inside of each end board and make a mark. 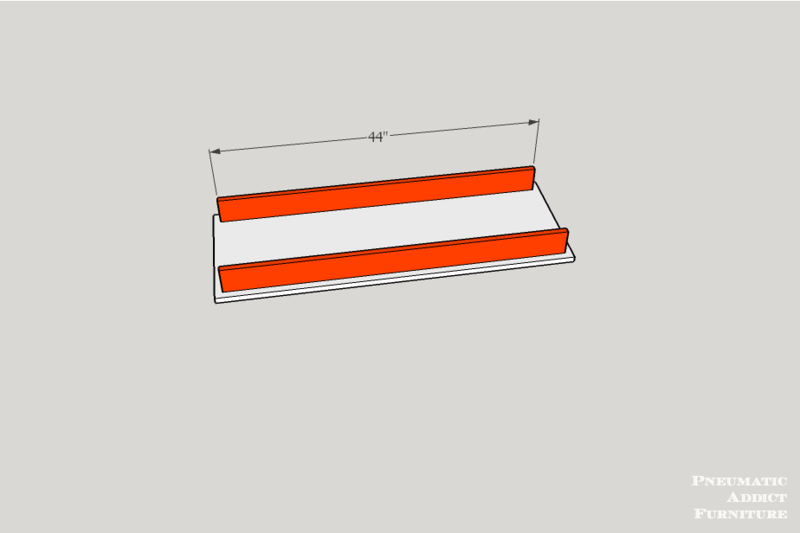 Line up the outer edge of another 13 3/4" 1 x 4, check for square, and connect with 1 1/4" pocket hole screws. Repeat the process, measuring from the inside of the other end board. 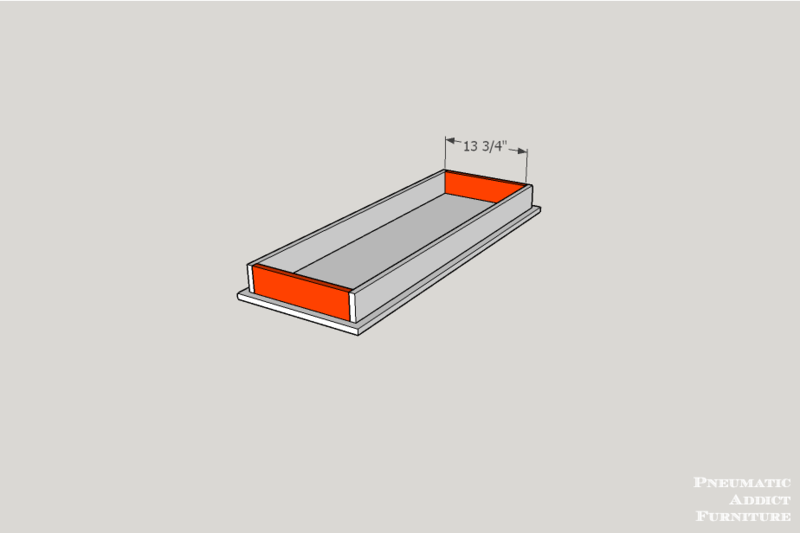 When you are done, you should have two, 11 1/8" wide sections and one, 17 1/4" section. The saw blade will remove 1/8" of material, so when you have made both cuts, you will be left with two 13 15/16" sections of board and one 17 7/8" section of board. Don't panic if your doors aren't the exact same measurement as mine. As long as you're close and the two outside doors are the same, you'll be fine. 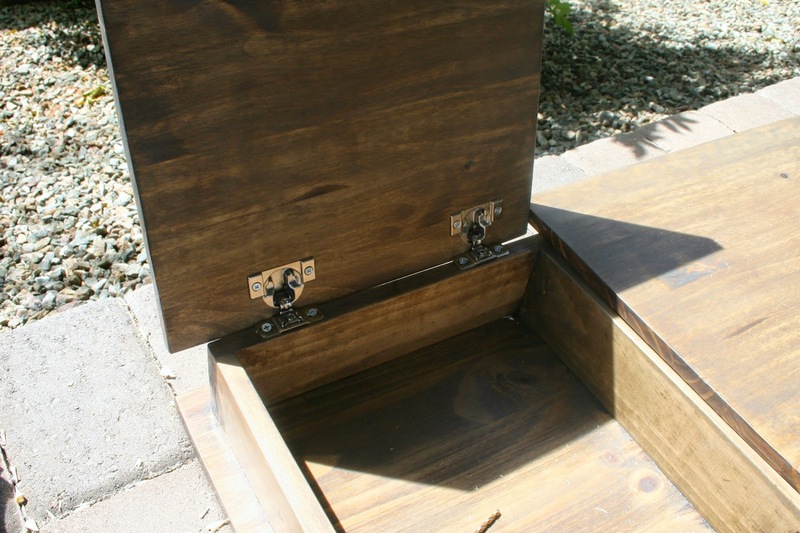 At this point, I recommend applying the finish to the vanity box, and both sides of the doors. It will much harder to paint or stain with the doors attached. I gave my wood a cool, medium stain with a couple coats of a dark toner, and sealed everything with 3 coats of lacquer. 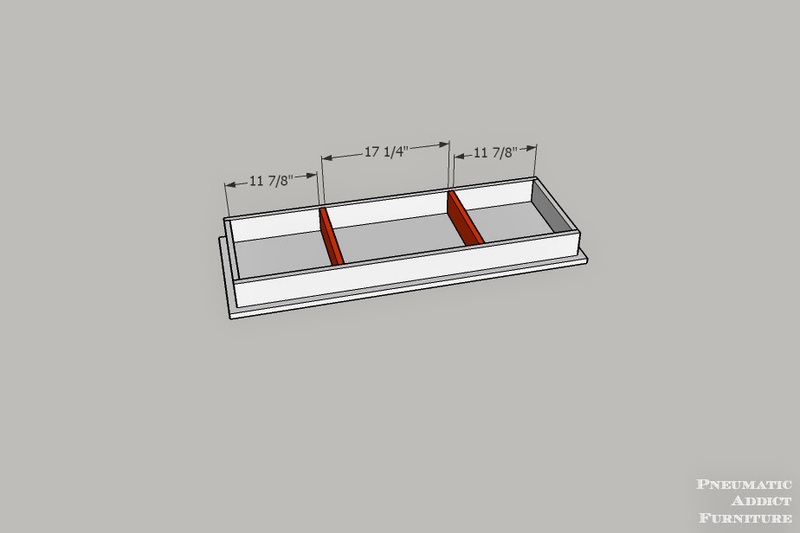 To attach the doors, you will need a pair of full overlay cup hinges for each door. I know they sound scary, but they really aren't too bad! 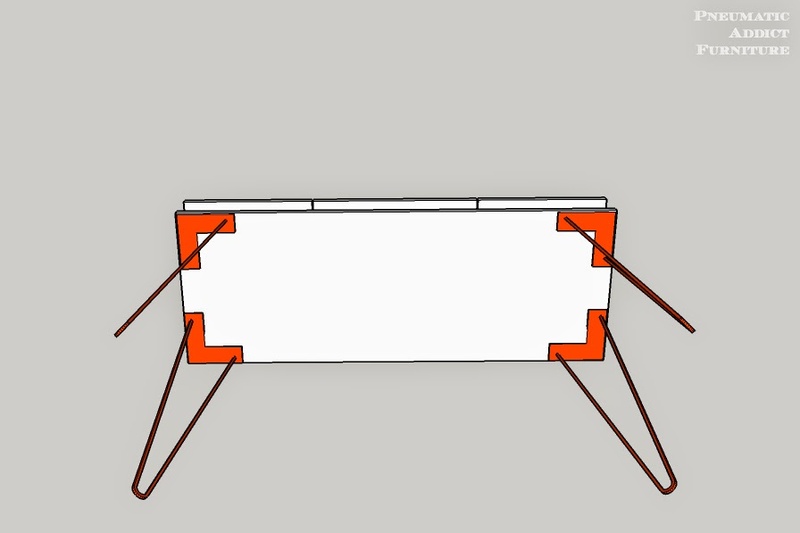 Here is a great video tutorial showing how to install this kind of hinge. I'm always scared to drill two huge holes into the underside of my door, but the little guide that comes with the drill bit kit makes it easy to line everything up. Time to address the legs. 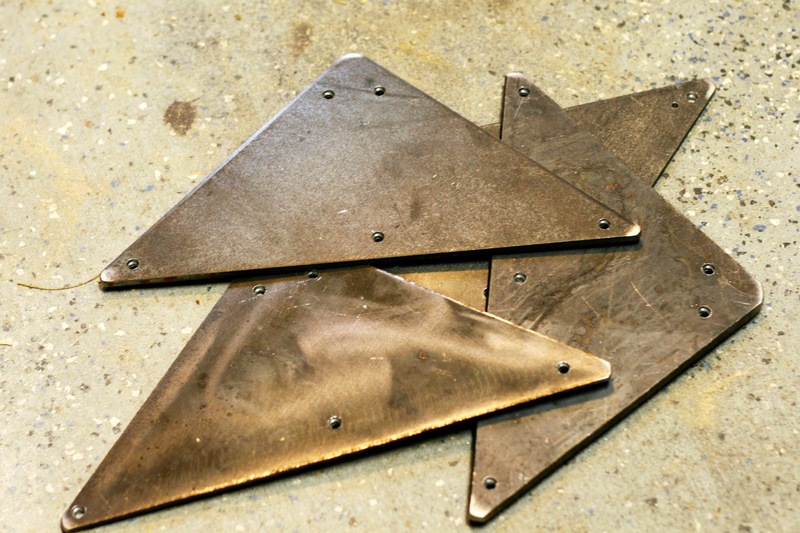 I made four, 26" DIY hairpin legs following my tutorial, but instead of using L-brackets like I did in the tutorial, I used pre-cut 3/16", 8" steel triangles. I picked up the steel from a local metal supplier and the materials for all four legs only cost me around $24. Google "metal supply" in your area and I guarantee you'll find a local distributor who is open to the public. 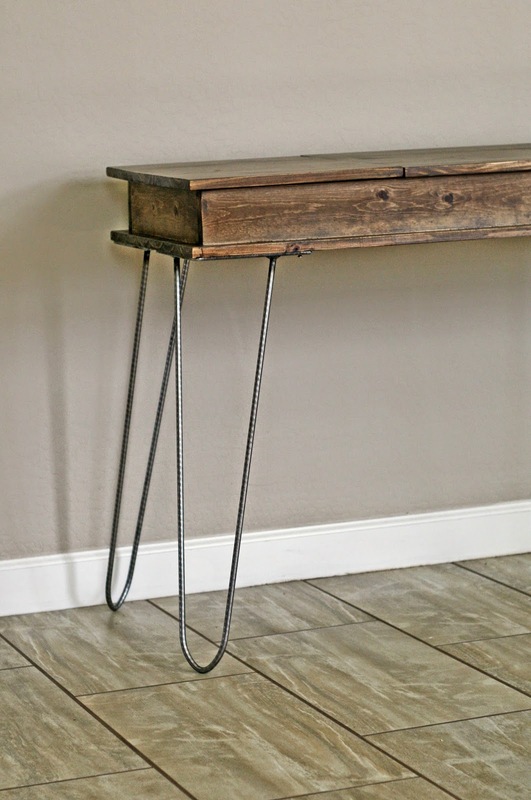 If you're not feeling like creating DIY hairpin legs, you can definitely buy them. 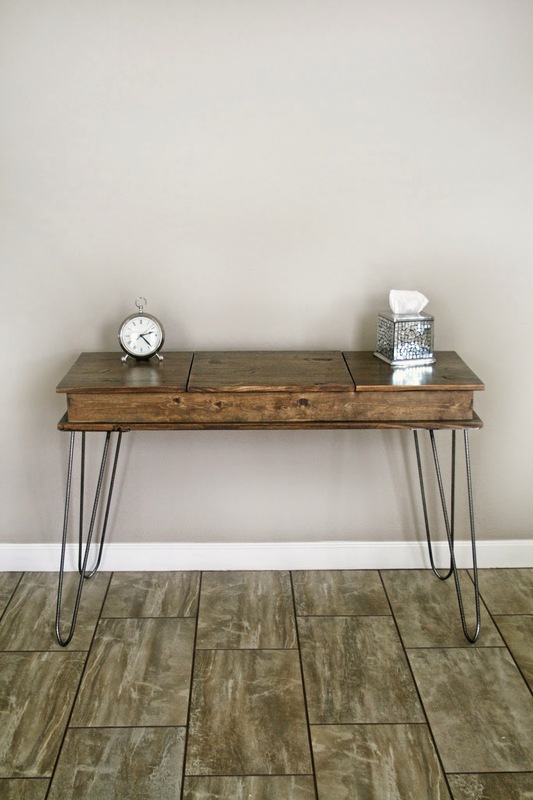 I found a website that sells 26" height legs with pretty quick turnaround (here). To attach the legs, flip the vanity over. 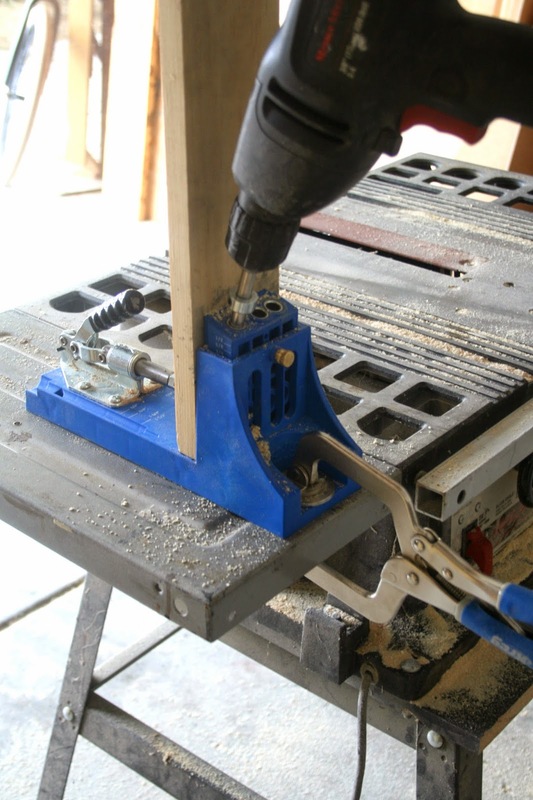 Line up each leg, 1/8" from the edge of the wood, and attach with 5/8" #8 wood screws. Now you can flip it right side up. Open the middle door and attach a mirror to the underside. I actually used an inexpensive, dollar store mirror left over from this project. *Exterior mounting tape or *Command Strips would work great to hold the mirror in place. My beautiful friend Nicki volunteered to be model. There is quite a bit of storage in this bad boy. 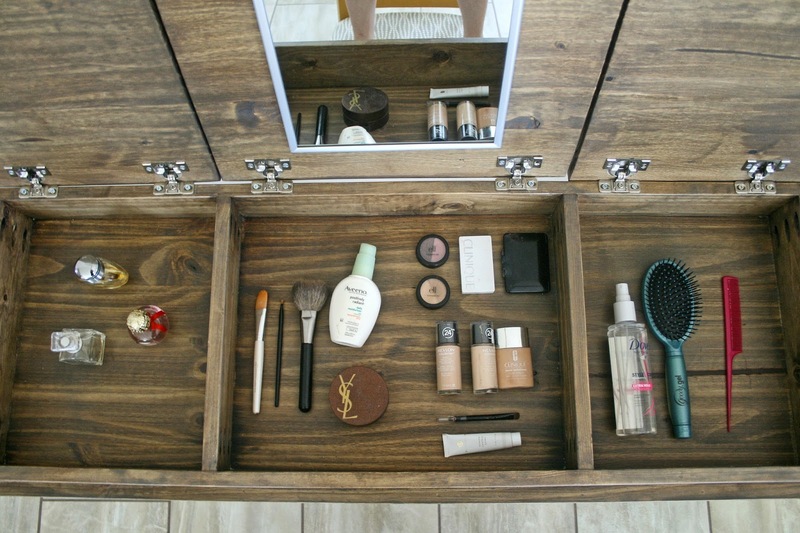 Perfect place to stash make-up or hair supplies. Lets have some more photos shall we? Now, it's time for the really exciting news! 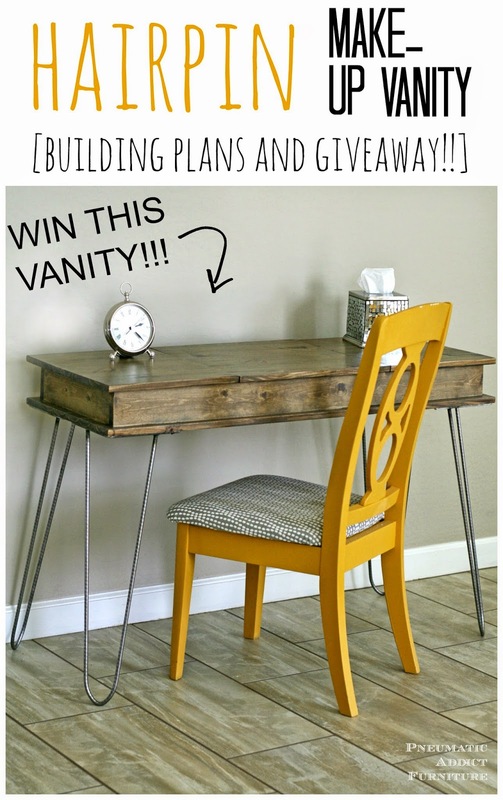 Thanks to Kreg Tools, one of you lucky people will WIN this very vanity! We will pack it up and ship it right to your house. Remember, Mother's Day is coming up soon. 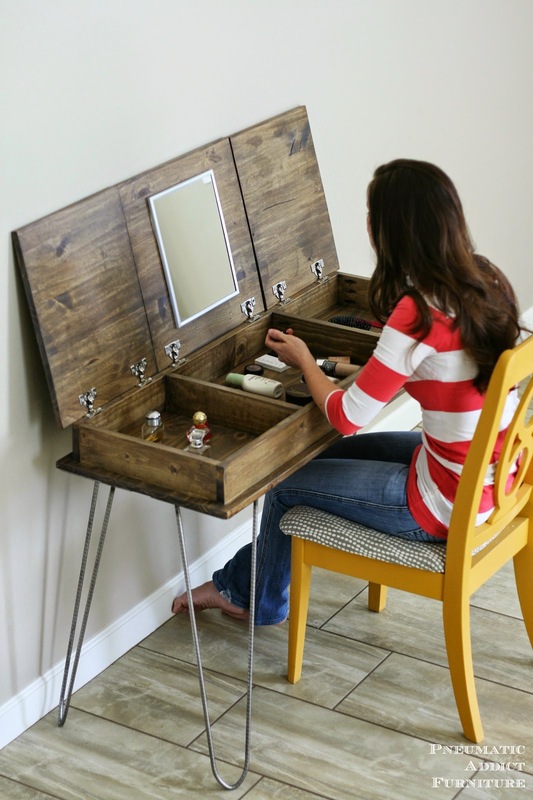 A new make-up vanity would be a pretty sweet gift for Mom. See Rafflecopter below for terms and chances to win. * This post contains affiliate links and sponsored content. I have been compensated by Kreg Tool Company, but all opinions and ideas are 100% my own. Look at you!! This is awesome, and the plans are amazing Elisha! You go girl!!! I would give this vanity to myself, oh wait, that isn't right, my sister! I would give it to myself! Why not? Nicely done and I gave it a tweet! Beautiful! My mom would love this! What a neat piece of furniture. IThis is absolutely beautiful! And If I won it I would give it to my mom who finally purchased her own home! It would look perfect in her new bedroom! My daughter but if she wasn't interested I'd have to keep it. She's at the age where she fixes her hair and puts on mascara now. So this would be perfect for her. My mom for her birthday! I know she would love this! Love this!! I am in the process of purchasing my first home, and the bathrooms are small, so this would be perfect in my bedroom!! My mom would really love this. Great Mother's Day present. Thanks for the opportunity! I would give this to my sister Mary! I would give it to my daughter who recently lost everything in her home and has to start all over again. i would give it to my tween daughter, she would just love it!! I actually think this is one I would keep for myself! 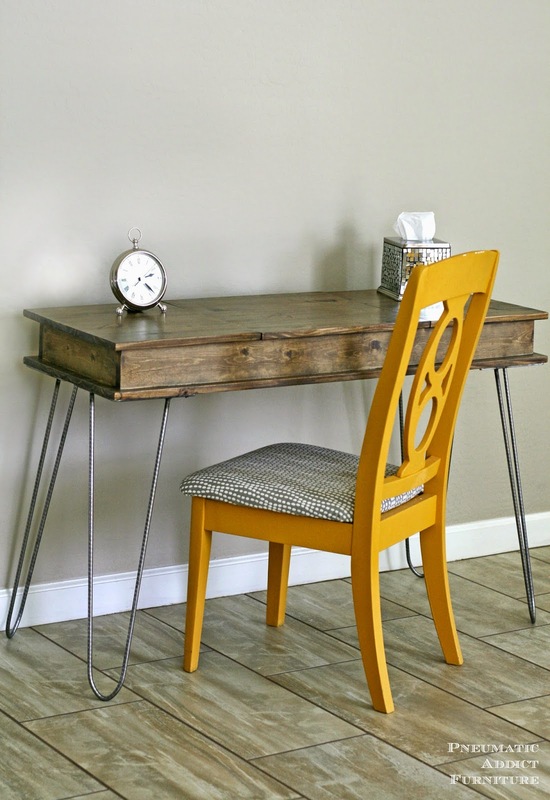 I have a blank wall in my bedroom that needs filled and this would be perfect! Thanks! Is there a way to mod these that I'm not seeing? Hi Trae! I'm sorry you are having trouble. The hinges in the materials list are the ones I used, but I bought them locally, so maybe there is a small difference? I would drill the cups further away from the edge of the door if you aren't getting the overlay length you need. You won't be able to open the door past 90 degrees, but you would get the full, 1-1/2" overlay. I hope this helps. Let me know if you have any more questions! Elisha, thanks so much for your response! I adore your site, it's really come in handy. Back on the hinges, in your photos it looks like your hinges mount to the face, while amazon mounts inside. I'm wondering if this could account for my missing overlay or? Thank you so much Trae! I agree, the hinges sound like they are the cause of the problem. Could you email me a photo of them? pneumaticaddictblog@gmail.com Don't get discouraged! Cup hinges are tricky, even for someone with experience. I really appreciate you following along. I'll be happy to help however I can. Thanks for sharing this! I just sent it to my husband asking him to make it for me. :) I can't wait to check out other stuff on your website. I am by all means not a handy person. On that note my daughter has asked me to build this. Unfortunately I cannot find at Lowes or Home Depot the 1 x 18 x 48 piece of wood. I am looking only at hardwood. Can someone help me find this? Same here. I just changed the size of my seat to work with wood from Lowes.